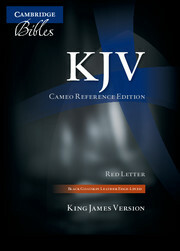 The Cameo Edition is a classic Cambridge typesetting of the King James Version, originally produced in the 1920s for letterpress printing. It has been widely admired by generations of readers for its solution to the Bible designer's dilemma of readable type in a manageable size. Unavailable for a while, the Cameo Reference Edition is re-issued in response to continued consumer interest, in a new range of binding styles. The reissue has offered an opportunity for the print image to be enhanced, so while the text is presented in same familiar layout and the original Petit Medieval Clarendon type, it is now sharper than in printings of recent years. 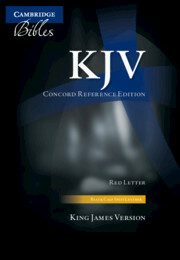 The Bible comes with a concordance and 15 color maps. The text has pronunciation marks for names and the words of Christ on earth are printed in red. 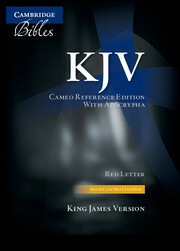 This edition includes the Apocrypha, rarely found in modern KJV Bibles. It is printed on India paper with gilt edges, it has a presentation page and two ribbon markers and is bound in black calf split leather.